The first book in the series, the backgrounds are gritty and beautiful. Two absolute standouts are Pippi’s “Winter Sunset” which highlights a barren scene with gorgeous shades of blue. The other is Kusakabe’s “Hinashizakaue,” a snowy scene that captures a lonely mood. This is a must-buy for any fan. 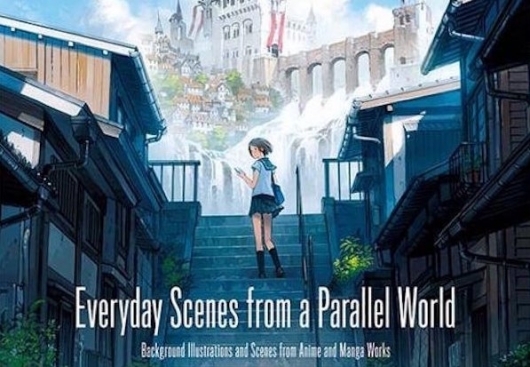 Everyday Scenes from a Parallel World is a celebration of the beauty of the scenes and backgrounds in anime and manga. This unusual book turns the spotlight exclusively on the scenes and background illustrations. 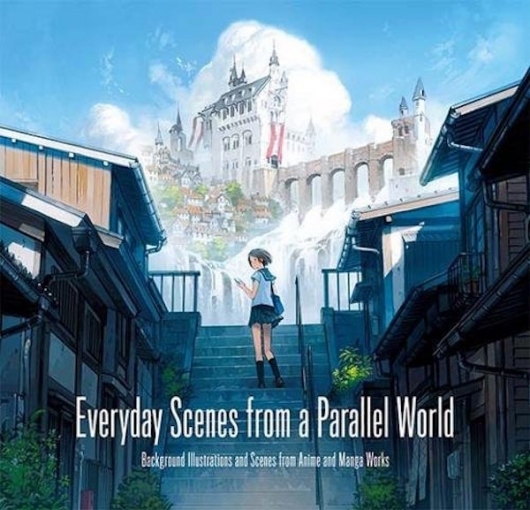 With only a few ordinary characters in these scenes, attention here is focused on the beauty of the illustrated backgrounds. These background artworks feature familiar scenes from daily life: nostalgic townscapes, detailed cityscapes, intricate architecture, rooms that look like doll houses, etc. They are extremely realistic and detailed–almost like photographs–but at the same time give readers the sense that we are looking at images of a parallel world. The works featured are by 39 well-known, mostly Japanese creators, illustrators, and animators. Some creators featured have made their entire careers specializing in drawing backgrounds. Frequently overlooked, this book finally gives them the recognition they deserve. Additionally, a section that explains drawing techniques and materials is included. The profiles of creators with messages from each, descriptions of each creator’s techniques and preferred materials are written in both Japanese and English text.